syn1588® PCIe NIC receives highly accurate time (accuracy 10 ns) independend from network utilization and CPU load without real-time requirements for the node’s operating system. PCs equipped with the syn1588® PCIe NIC synchronize their local hardware clock with an accuracy of 10 ns or better to the absolute time information distributed by an IEEE1588 grandmaster. 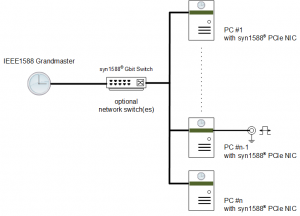 A PC equipped with the syn1588® PCIe NIC may act as an IEEE1588 Grandmaster on your network. The syn1588® PCIe NIC may synchronize its local hardware clock to an external absolute time reference like e.g. a GPS receiver. The syn1588® PCIe NIC acts basically as a standard 10/100/1000 MBit/s Network Interface Card (NIC). 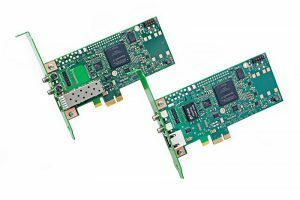 Beside the standard function of sending and receiving Ethernet packets the syn1588® PCIe NIC includes dedicated hardware to implement high accuracy clock synchronization following the IEEE1588 standard. The syn1588® PCIe NIC includes a full featured IEEE1588 hardware clock as well as complex timestamping hardware. All time critical elements of an IEEE1588 system are embedded in the syn1588® PCIe NIC thus removing all timing constraints from the software. There are no real-time requirements for the operating system or the software stack. Due to its special structure the CPU load for the required IEEE1588 stack (e.g. Oregano Systems syn1588® PTP Stack) is negligible.